Primarily a sports car by design, the De Lorean DMC-12 was the car to beat when it was launched in Northern Ireland in the early 1980’s. The car was however manufactured and intended for the sports car crazy-American Market with its gull-wing doors of fiberglass and stainless steel. It would surprisingly set the mold for future generation variants from automobile enthusiasts. To date, only around 6,500 units of the De Loren DMC-12 are believed to exist. This is from a lot of 9,000 produced between the late 70’s to the early 80’s – the latter part of 1982 to be exact. And out of the limited number of De Lorean DMC-12 cars only around 23 were converted and licensed as right hand drive models. The car was designed by chief designer Girogetto Giugiaro. Initially launched in 1977, mass production only started in 1981. Many of the original components and specifications were altered during mass production. The wheels, interiors and even the original hood style of the De Lorean DMC-12 by Giugiaro were modified. You may start to wonder why most of the De Lorean DMC-12 cars produced are right handed. This is because of the fact that although it is an Irish produce, it mainly targeted the left hand-driving American Market. Because certain regions like the British Isles, Australia, New Zealand and Japan all had right hand drive traffic, the De Lorean DMC-12 never really reached their automobile consumer markets. 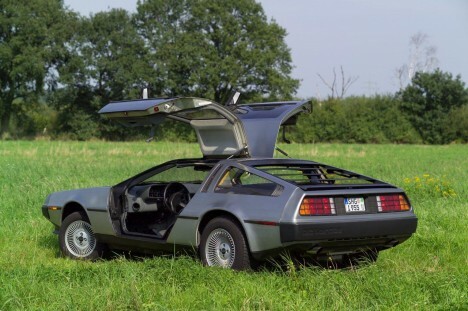 It was only a British car converter, Wooler Hodec, who attempted to sell converted De Lorean DMC-12’s. Great Britain only saw 23 of these converted De Loreans licensed for British road use and with its exclusivity came a hefty price tag of more than £25,000 for each unit. Why would anyone want to spend big bucks for an old, gull-wing door type sports car? For the non-conformists most probably, the De Lorean DMC-12 was quite a lure with its various unusual features. Aside from its flamboyant gull-wing style doors, the De Lorean DMC-12 featured an unpainted body panel made of stainless steel. How many cars would you see with an engine mounted at the rear end? Well you guessed it, De Lorean DMC-12 has one. Sandpaper or normally was used to even out minor scratches found on the body panels of the De Lorean DMC-12 made of stainless steel. But this is certainly not the case for the gold plated versions which sold for around $85,000! Other special editions of the De Lorean DMC-12 that were released made use of Porsche engines, which replaced the original De Lorean car engines made by PRV. One of the most notable recent sightings of the De Lorean, was in the 2004 De Lorean Car Show. Despite only a few years of mass production, the ever rising popularity and patronage for the car is amazing. This has been attributed to its pop-culture popularity with its debut in classic films and even collector’s toy lines. For De Lorean diehards, the Florida-based De Lorean Motor Company has a neat surprise housed in their showroom. They are releasing the fully modified and completely restored version of the De Lorean DMC-12, which is definitely a rare breed. The best part is, the said version is absolutely for sale!